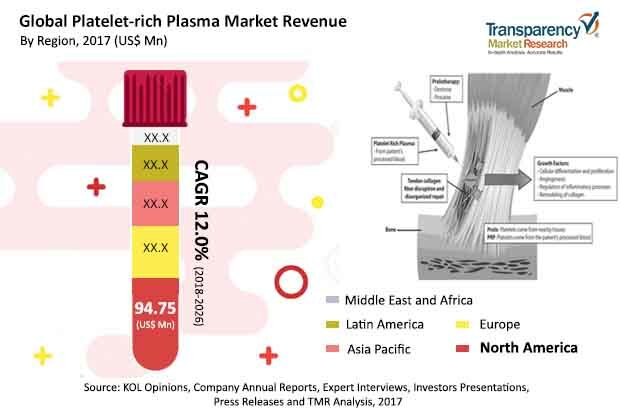 Transparency Market Research (TMR) has published a new report titled, “Platelet-rich Plasma Market - Global Industry Analysis, Size, Share, Growth, Trends, and Forecast, 2018–2026”. According to the report, the global platelet-rich plasma market was valued at US$ 195.2 Mn in 2017 and is projected to expand at a CAGR of 12.0% from 2018 to 2026. Technological advancements, regulatory approvals for new devices, and increase in awareness about platelet-rich plasma therapies are anticipated to drive the global market in the next few years. North America and Europe are projected to dominate the global platelet-rich plasma market during the forecast period, primarily due to the high prevalence of orthopedic disorders, rise in incidence rates of rheumatology, increase in the number of sport injuries, and surge in adoption of platelet-rich plasma therapy. The platelet-rich plasma market in Asia Pacific is expected to expand at a significant CAGR from 2018 to 2026. This is attributed to surge in investment in health care infrastructure, economy growth, large population base with orthopedic and rheumatology disorders in emerging countries such as China, India, South Korea, and Malaysia, and rise in per capita health care expenditure in the region. Increase in the number of orthopedic patients globally is considered a major factor fueling the growth of the global PRP market. PRP treatment reduces injury healing time in orthopedic diseases from four to six months to three to five weeks with surgery. Such sharp reduction in the healing period is likely to propel the PRP market during the forecast period. According to the Arthritis Foundation, approximately 54 million adults and around 300,000 children had doctor-diagnosed arthritis in the U.S. in 2017. This number is projected to reach 67 million by 2030. According to the International Osteoporosis Foundation, globally, 1 in 3 women aged 50 years and above is likely to suffer from osteoporotic fracture. The ratio is 1 in 5 for men. Hence, high prevalence of orthopedic diseases and increase in preference for PRP therapy contribute to the growth of the global PRP market. The report offers a detailed segmentation of the global platelet-rich plasma market based on type. Pure platelet-rich plasma, also called leukocyte-poor platelet-rich plasma, is blood plasma that contains only platelets and trace amount of leukocytes. Major advantages of pure PRP include ease of application to injuries and ligaments, conventional method of PRP production, rich concentration of platelets, and limited contamination with RBCs. Pure PRP accounted for the dominant share of the global PRP market in 2017 due to its widespread use in various applications and rich content of platelets. The segment is likely to continue to dominate the market during the forecast period from 2018 to 2026. In terms of origin, the global platelet-rich plasma market has been segmented into autologous PRP, allogeneic PRP, and homologous PRP. The autologous PRP segment is likely to account for significant share of the market by 2026. Autologous blood is a patient’s own blood, and hence diseases and infections related to blood transfusion are almost negligible. Therefore, cost of blood tests and analysis is reduced on the use of autologous origin of PRP preparation. Demand for autologous PRP products is expected to increase due to elimination of cost of clinical analysis for blood-borne diseases and the fees to be paid to blood donors. The allogeneic PRP segment is projected to expand at the highest CAGR during the forecast period. The segment is poised to gain market share by the end of 2026. High number of growth factors in allogeneic PRP compared to autologous PRP is expected to drive the segment during the forecast period. In terms of application, the global platelet-rich plasma market has been segmented into orthopedic surgery, neurosurgery, cosmetic surgery, general surgery, and others. The orthopedic surgery segment dominated the global market in 2017 and the trend is likely to continue during the forecast period. Prevalence of osteoarthritis, rheumatoid arthritis, fibromyalgia, juvenile arthritis, and other forms of orthopedic disorders is increasing primarily due to the aging population, obesity, and changes in lifestyle. According to the Centers for Disease Control and Prevention, nearly half of the population aged 65 and above reported doctor diagnosed arthritis during 2013–2015. This percentage was as low as 7.1% in the population aged between 18 and 44. The cosmetic surgery segment is expected to grow at a rapid pace owing to multiple applications of PRP in cosmetic surgeries and cost-effectiveness. The platelet-rich plasma market in Asia Pacific is projected to expand at a significant CAGR of 13.7% during the forecast period. Large number of patients with various rheumatology disorders, rise in number of sport injury cases, presence of emerging economies such as China and India, large geriatric population in Japan, and increase in awareness about the advantages and applications of PRP in various therapeutic areas present significant opportunities for global players in these countries. North America is anticipated to dominate the global platelet-rich plasma market owing to high prevalence of orthopedic and rheumatology disorders, increased adoption of PRP therapy in treatment of various disorders, and significant rise in number of plastic and cosmetic surgical procedures in the region. The global platelet-rich plasma market is highly consolidated, with few global players accounting for major share. Harvest Technologies Corp. (Terumo Corporation), Arthrex, Inc., and Zimmer Biomet Holdings, Inc. are the key players that dominated the global PRP market in 2017. Efficient PRP products and wide distribution networks are the key strategies adopted by these market players. Most of the small scale and R&D companies strive to establish strategic partnerships and distribution agreements with leading distributors and or related companies for the commercialization of their products in the global market. Other prominent market players include EmCyte Corporation, Regen Lab SA, Exactech, Inc., and Cesca Therapeutics, Inc., Nuo Therapeutics, Inc., DePuy Synthes (Johnson & Johnson), ISTO Biologics, and AdiStem Ltd.